Because I’m usually the one behind the camera at Guides and Senior Section, there are very few pictures of me ‘at work’ as a Guide leader from the last year. This one was taken by one of our Young Leaders (I think!) when our Guide unit visited Pets At Home to learn about pet care. One of the Guides got very nervous and scared holding this bunny and in the end I held it while helping her to calmly stroke it. We named the bunny Simba because we thought he looked a bit like a lion. After the holidays one of our Guides ran up to me to tell me that she had found out from the Pets At Home staff that Simba had now been adopted by a family. I’ve written before about why I volunteer with Girlguiding. Essentially it’s for two reasons. Firstly, to give back to the organisation that gave so much to me as I was growing from a little girl to a young woman. Secondly, because it can be so rewarding to watch and support girls grow into young women. Over the last three years it’s been hard to keep going, with job changes, trying to finish university and other stuff. But it’s made possible by working as part of a team of other volunteers. We take our turns, we help one another out. We don’t just commisserate and cheer one another on during meetings, but share what’s going on in our lives outside Guiding too. That’s why last year I was at the weddings of some of my fellow leaders. It’s why right now me and our unit helper are collecting lego cards for our unit leader’s youngest son! We keep doing it because we try to make it fun. We keep going through the harder, frustrating times because we have those moments where we realise how much it is worth it! 8 years of my life have been given to volunteering with Girlguiding. More if you count my time as a Guide helper at a Brownie unit! And I hope I can give many more. Here’s to all the volunteers….past…present…and hopefully future ones! To find out more about how you can volunteer with Girlguiding head over to their website. You can read my previous years of Volunteers Week posts here and here. …you’ll find a post that I was asked to write by Girlguiding UK’s Peer Education team just before the summer holidays began. If you’d like to read it click here. It’s been quiet around these here blog parts since the Scottish summer holidays began (we’re already half way through them in Edinburgh – eek!) but I thought I’d make a brief return to mention the photo I posted on Twitter and Instagram yesterday! I was amongst the first batch of Rainbows, but waiting lists were such that my friend Katrina and I were probably about 6 when we joined. I don’t remember being there too long before I got to move up to the Brownie Pack which met in a church hall just down the street from my Nana & Grandad’s house in Edinburgh. I LOVED being a Brownie. I learned to cook (though I have a memory of Katrina getting food poisoning after from the sausage, bacon and egg we cooked but I didn’t eat…hmm…let’s forget about that). I remember learning about the Brownie story and being so excited to find stories in the local library about Brownies (like this one) and even more excited when I discovered that Maisie the Cat was a Brownie (who ended up meeting Nessie while at Brownie Camp). I loved singing all the songs, and the traditions of dancing round the toadstool singing ‘We’re brownie guides, we’re brownie guides…‘ and then with my fellow Pixies singing our special Pixie song. I remember the honour when you were chosen to take the subs from each Brownie and turning the coins (was it 20ps or 50ps? I can’t remember) into a shape of some sort. Sometimes an owl, or the trefoil, or letters. I remember going to a barbecue with lots of other Brownies, and huge Edinburgh Thinking Day events. I remember practising for my athletes and agility badges in a car park across the road. And I remember how seriously I took my role of Sixer of the Pixies. I loved making sure new Brownies were welcomed. Oh yeah, and I loved getting badges. My favourite being my Booklover and Writer badges. It was lovely how there was so many different badges – some that taught us important life skills (cook, house orderly, first aid), some that helped the crafty folks (artist, toymaker) and those for the sporty Brownies (athlete, agility, swimmer). We didn’t get to do Brownie Camp at my Brownies, but I think the knowledge that this was something the older girls did in Guides was the main reason I was keen to move up as soon as I turned 10…even though I was somewhat terrified of the Guide leader (!). When it came to doing my ‘Service Flash’ as a Guide, I chose to volunteer as a Young Leader of the Brownies with one of my friends and we had a blast. In fact, I think the two of us were so in touch with our ‘inner Brownies’ that perhaps the Brownies were more mature than us. I realise now it’s rare for teens to be willing to be silly – but we had no problem and would happily join in the games to encourage Brownies! Brownies for me was the real beginning of my life in Girlguiding – both becoming a Brownie, and later becoming a leader. When I was living in university halls I helped with a Brownie Pack in Aberdeen and given the title of ‘Snowy Owl’ chosen by the Brownies. I loved working with those two Brownie Units in Edinburgh and Aberdeen (though I prefer working with Guides & Senior Section). This year, the Brownies turned 100. Girlguiding designed a t shirt that is being sold by Debenhams this summer in celebration of 100 years of Brownies. 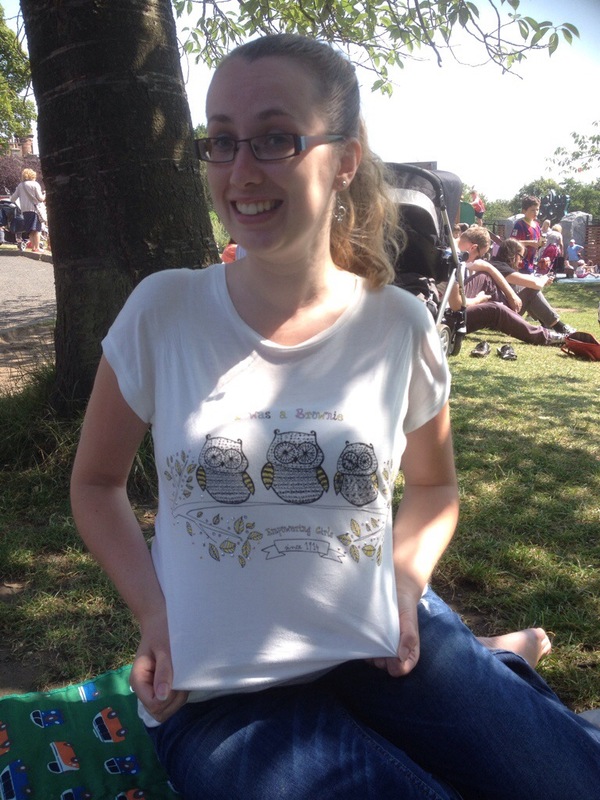 I picked one up on Saturday and my friend (who also used to be a Brownie) snapped me wearing it on a trip to Edinburgh Zoo. A whole group of Guides from North East England were sitting right by us too which was great to see. I wear it proudly, knowing I’m part of a movement that has been empowering girls since 1914.